1) Select the right spot: Preferably somewhere well-lit, but not in direct sunlight as the colours in the artwork can fade and the reflection will bounce off the glass. It will have more of an impact if it’s the central focus of a room, so the wall that is most visible when entering the room is usually a good choice. 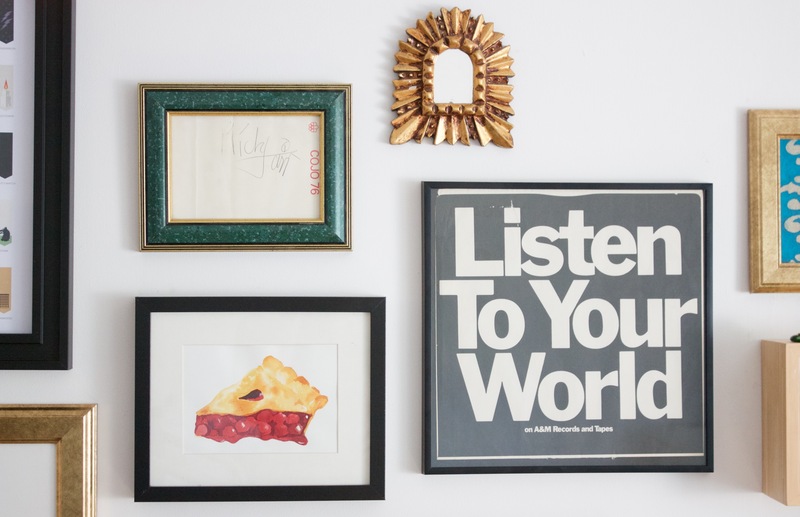 2) Choose art or pieces that are meaningful to you: signed autograph, concert tickets, a child’s doodle, inside jokes… pieces that hold happy memories will conjure up good feelings when you look at them. I’m pretty fond of my Mick Jagger autograph from 1979, passed down from Josh’s mom. I also love objects that were collected during our travels, such as the alligator head from New Orleans. 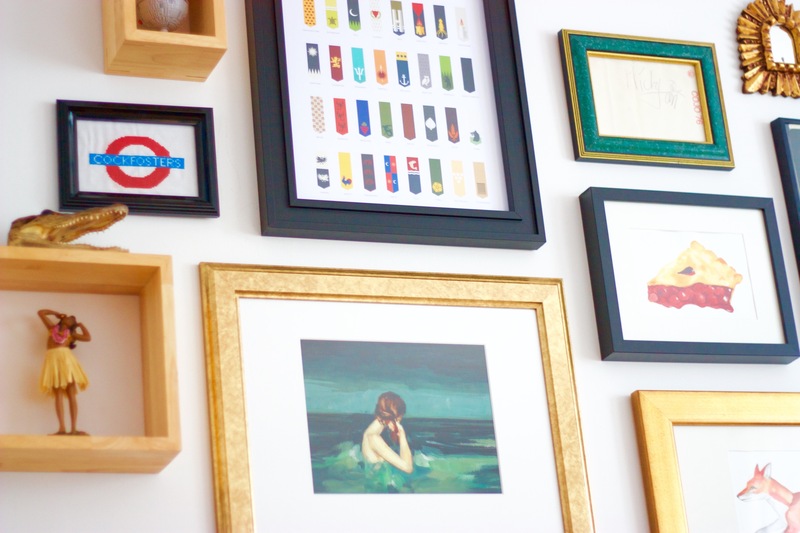 3) Look for variety in your frames: Unless you’re going for the monochromatic look, finding the right frame for each piece of art can bring out the details that might otherwise go unnoticed. Bonus points if you can find a good vintage frame, but I also like to check Ikea (cheap), DeSerres and Michaels (pricey but customizable). 4) Try out a few combinations on your floor first: there are so many ways to lay out your frames and art, it’s hard to get it wrong really. Generally it is advised to put the biggest piece in the center and work your way out, saving the smaller pieces for the outer edges. 5) Spacing: If you are placing your gallery above a couch, the bottom of the lowest frame should be roughly 5-6 inches above the couch. How far apart should the frames be? 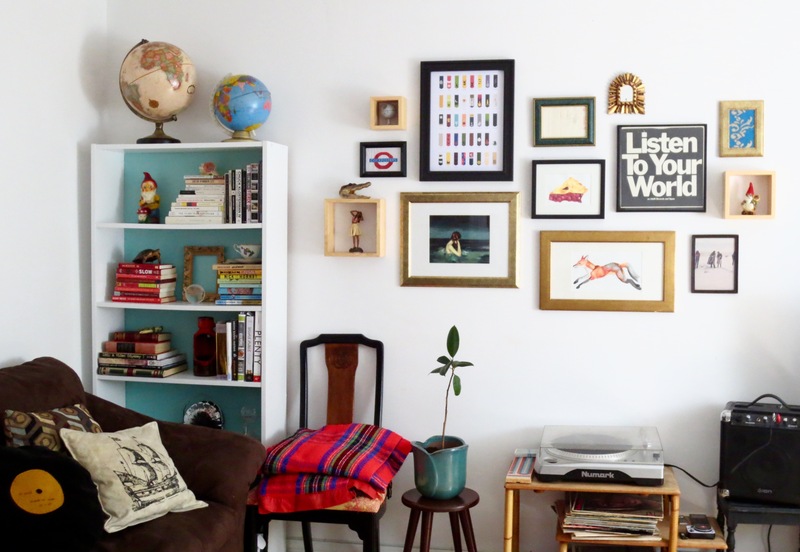 I particularly like 2-3 inches between frames, but I’ve seen randomly scattered gallery walls that also looked great. 6) Get a second pair of eyes: I highly recommend getting help from someone with a good aesthetic sense. 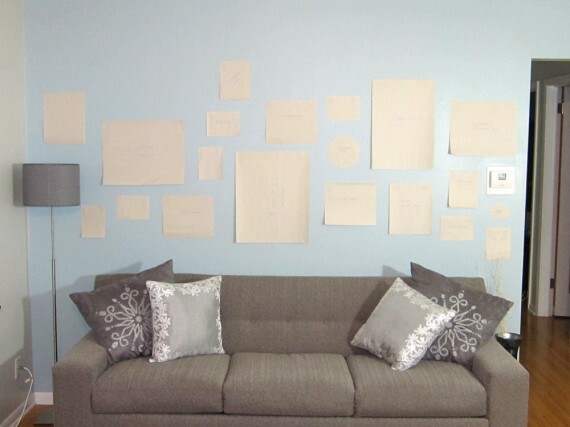 Attempting this project alone may lead to many unnecessary holes in your wall. 7) When in doubt, use a template. 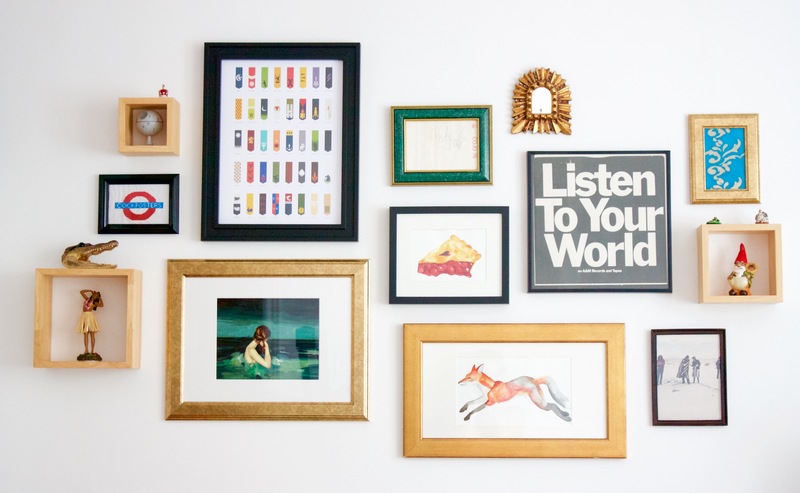 Trace pieces of brown or colourful paper around your frames, cut them out, and see how it all fits on the wall space. 8) Use a Level! Preferably not the kind you download as an app on your phone. thanks! have fun decorating, it would be great to see how your room turns out! 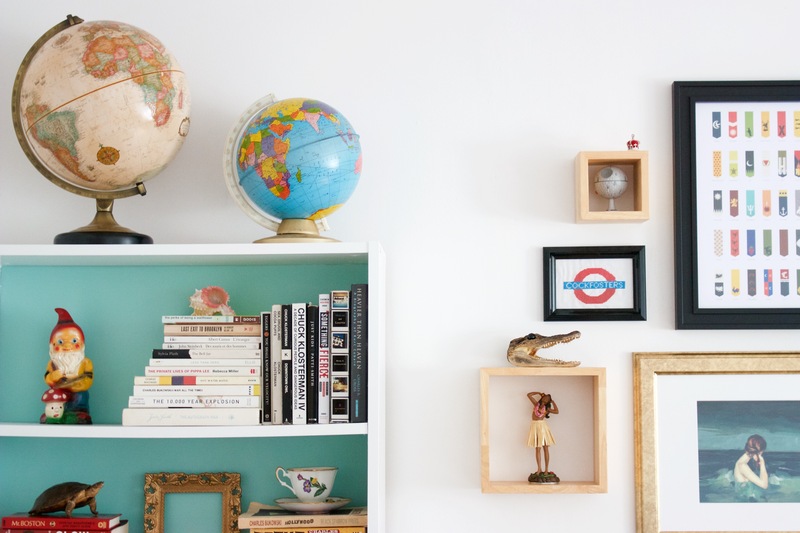 I’m looking to redecorate my room soon so this is a great inspiration post for me! I never even thought of doing this before! I’m glad you are inspired! It can really transform a room, I’m sure you’ll love the result. Thanks for stopping by!